Aminu-suya’s suya is the best. Not that I have been eating suya from different places and then decided that his own is the best, I just think that his suya has to be the best for everybody to be buying it. People say that if you eat Aminu-suya’s suya once, you will continue to eat it for the rest of your life. I have only tasted it once; the first day I found the courage to ask him to cut small for me. He had just arrived and was still setting up the meat just before darkness covered both of us. He looked at me pitifully with a smile, as if sympathising with me for what the aroma of his suya must have been doing to me. I tore that suya with my teeth and so much joy. I did not want it to finish. I had to wash my hands properly that day with the accumulated water in one empty bag because Aunty must not perceive suya around me or she will beat hell fire out of me and say: “All. Liars. Shall. Perish. In. Hell. Fire!” A stroke always accompanies each word and the last word always brings the biggest stroke. Aunty is my mother, but sometimes I wonder. I hear she gave birth to me when she was very young, she is still very young and she is very wicked, as if I am the reason God punished her with poverty, for having too many men. I have not had another taste of Aminu-suya’s suya since then, but I have not forgotten the taste. Of course I begged him again the following day, but this time he did not give me and I still don’t know why. Aunty does not understand why I always sell out the two bags of pure water sachets she apportions to me to sell every evening. She thinks I’m in between queues of cars in traffic, shouting, “Puuure water!” like the other kids who also hawk in the evening. All I have to do is stay near Aminu-suya, because every one of the numerous people who buy his suya will need water. If they think they will not need water, I will tell them that the pepper in Aminu’s suya will kill them if they don’t drink water. They always laugh and then buy my water. The only problem with this sense I use is that I always perceive so much of the suya without eating it. I cannot buy it because he does not sell cheap suya. His suya starts from N100 and it is small, like the one he cut for me that first day. I cannot beg him again, because now I know he will not give me. Stealing it is not possible because my hands cannot even reach it where he places it, even if I try. Besides, Aminu gets really angry when people try to cheat him. I eat my portion in my sleep. Aunty has beaten me out of sleep several times because she said I was chewing so hard, and “anything you eat in your dream is food of the witches,” she always says. But me I know what I was eating; it is just Aminu-suya’s suya. Aminu has different types of customers, but he tries to treat everybody equal. He has plenty regular customers and he tries to remember their names. There are some who are passing our bus-stop for the first time, but the aroma of the suya makes them stop to buy. And then there are men who park their cars by the road because of him, but he will not leave the customers flocking around him like bees to attend to any big man. The big man will have to come down and struggle like everyone else. Only that the big man can afford to pick a big piece of meat and throw it in front of Aminu-suya, to get his attention. “Aminu-suya!” Your voice must be the loudest for him to answer you first. “How much, that one?” It is the big man talking, not me. “One-five!” Aminu will shout too because of the noise coming from the bus conductors and those people who play loud music at the bus-stop so that people can come and buy. He will not look at the big man, but at the suya, turning it around as if to be sure he has not mentioned a wrong price. Other people will continue to shout his name for him to cut N200 or N400 or N100. He does not answer those N100 people on time but they are the ones that buy my pure water the most. “Pay one-two,” Aminu is likely to say, lifting the suya with his left hand, ready to return it. “Oya cut am“, the big man will say. “No onions abeg.” Big men don’t eat onions with their suya, I don’t know why. I didn’t come early on the day that was to be the last day Aminu-suya would come to his suya spot. But I was early enough to witness the beginning of the end of the lives of two grown men. People had not begun swarming around Aminu to sell suya to them by this time. 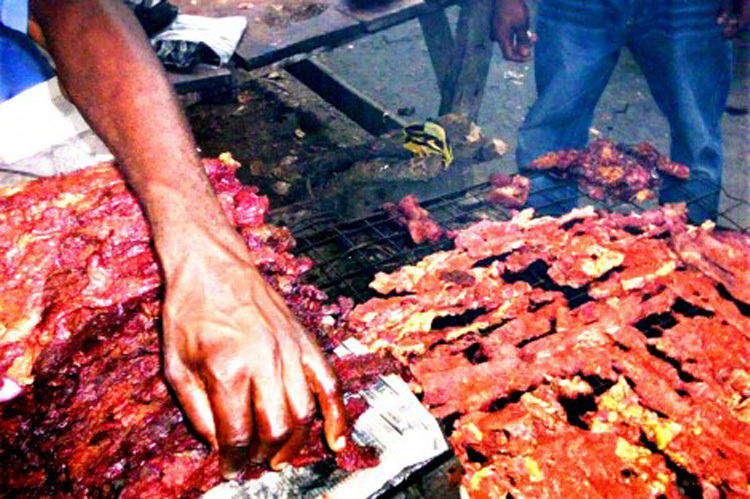 “Cut suya for me jor, were.” Kabiru, one of the area boys at the bus stop was fond of threatening Aminu and collecting suya from him without paying. They always called him Scorpion. “Scorpion, I don dey telli yuu, one day I go killi yuu for hia.” It was Aminu. Angry Aminu. “Iya e, oloshi!” Scorpion replied, stretching his five fingers and palms wide open towards Aminu to accompany his affront. “Iya for yoruba, na mama. No curse my mama, Scorpion. I go killi yuu if you curse my mama.” Aminu gesticulated his own warning with his knife. “Oloshi, ki lo fe se? Wetin you go do? Iya’laya e! Your great, great, great grandmother!” He picked up a piece of suya, tore part of it with his brownish teeth, turned around and began to walk away. Aminu went after him. He pulled Scorpion by his shirt and turned him around. He moved closer to scorpion and forced his right hand into his stomach. When Aminu pulled out his knife from scorpion’s stomach, there were pieces of human flesh and blood all over it. Scorpion’s suya laden mouth stayed open as he collapsed. People began to scream. One of the other area boys quickly rushed towards Scorpion. He lifted him briefly by his shoulders and then dropped him. “O ti ku!” he shouted, placing his two hands on his head, confirming Kabiru’s death. Immediately, two other area boys swooped on Aminu and disarmed him. They began to beat him as the other area boys began to run towards the scene. I had to go closer and then I stood on a big stone nearby to see what was going on. Soon, Aminu’s face became covered with blood and I could barely recognise him except for the yellow vest and black shorts he still had on. I could also hear some of the area boys saying Aminu should be killed. Suddenly, I saw Eru-iku, one of the leaders of the area boys, charging towards the crowd, carrying a keg in his hands. I put my two hands on my head. He pushed through the people and then began to empty the content of the keg all over Aminu. People began to step back and then he pushed Aminu towards his suya spot. The fire met him on his way there. I covered my face with my hands. Aminu began to scream. When I managed to separate two of my fingers to allow me see through vaguely, Aminu was congealing his fingers like a witch about to pounce on a victim. He was on the floor, with fire all over his body, screaming, “Waayo Allah! Waayo Allah!” from depths of excruciating pain as the fire sweltered his flesh, producing a repulsive odour. The whiff from his suya still hung in the air too. After burning like that for a long time, he gradually became silent, and stiff, and very black. It reminded me of what Aunty always says about hell fire, where she says all liars will perish in. This may be what it means to perish. I hoped in my heart that she wouldn’t end up there too, because of the numerous men that always came looking for her and the different lies she told each of them. I looked down at the object that was Aminu-suya. He will never come here to sell suya to anyone again, so I have to look for another way to sell Aunty’s two bags of water every night. Nice story. Its amazing how you preserve the young character’s voice through it all. An interesting read even though it tells of the reality and sadness of our country’s swiftness to sometimes execute vigilante justice. Kudos. A chilling and sobering piece….with thoughtful lessons to learn glean from. It was really good having humor around! !